Romaine Lettuce is a favorite of mine in salads. I’ve also read it makes an Incredible and Delicious Smoothie. The best and most amazing thing about lettuce, besides eating the tender green leaves, is the amazing fact that if the bottom of the stump is saved and placed in water, regeneration and new growth will occur. 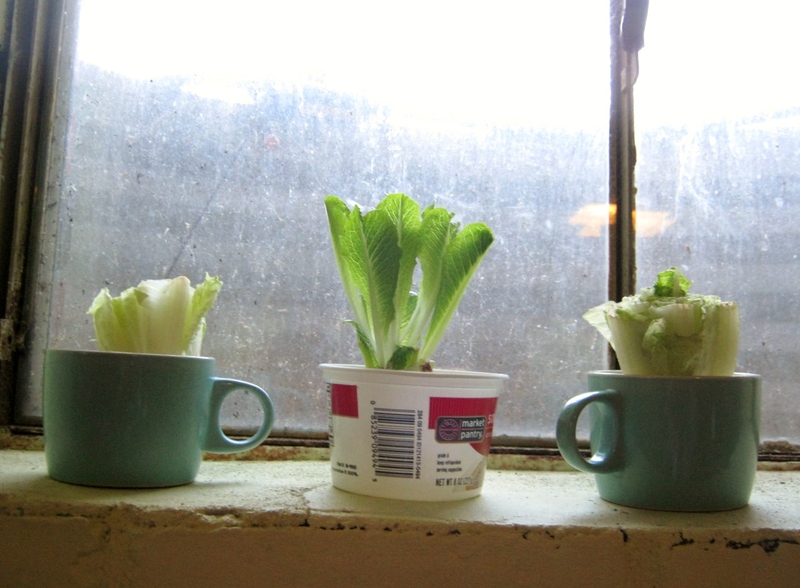 Above is a photograph of three romaine ‘stumps’ in various levels of regrowth. All I did to achieve this miracle was place each piece in a half inch of water, check the water level daily, and marvel as the stump began to grow anew. I am growing the romaine in a basement window well, and that explains the VERY dirty window in the photo as it is below ground level. The setting for the lettuce doesn’t look nice, but it creates the perfect environment for regrowing leafy greens…cool and bright all day. Experiment yourself with this method the next time you have a head of lettuce with the stem still intact. You have nothing to lose and a free harvest of lettuce to grow. Important Tip: Romaine Lettuce is one type of produce easy to find in the organic form. Often packaged as three hearts of romaine, spend just a dollar or two more, and you have salad free from any unnecessary pesticides. Thanks for this helpful tip. We keep tortoises and guinea pigs, and get through at least four romaine lettuces a week (its a nutritious staple for both). Will definitely try this out. I tried to grow romaine lettuce last year. I wasn’t sure exactly how to. It never looked like that. When do you get to eat your produce? and What do you mean “stump”? I am new to growing lettuce. I would love more information about growing lettuce. Thank you. Is it sitting in water or soil? Hi Kathi, After I cut off the top portion of the romaine lettuce, I am left with a “stumpy” looking end where the roots once were. I put this end in water and within a day or two new green leaves begin to grow in the center of the stump. I do not plant it in the ground again. What I do is harvest the new leaves when they are a few inches tall. These leaves are much smaller than the original leaves, but just as tasty. If the bottom area that is in the water begins to deteriorate or go soft, I then toss it out. As long as new leaves are growing, just keep it in water, and change that water every day or two to keep things fresh and bacteria free. Do you cut any part off from the bottom before placing in water? 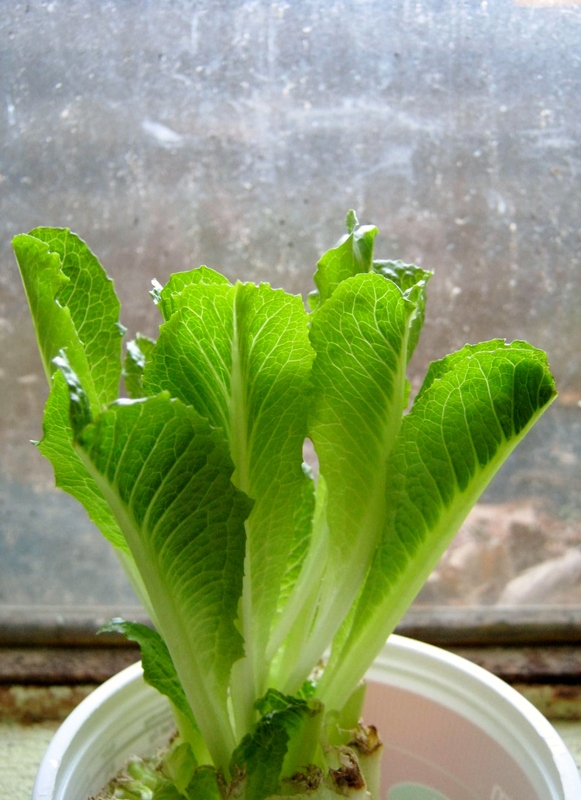 If you grow your own lettuce – just cut off near the bottom and new leaves will continue to grow. The only problem I see with this idea is that your food is not going to have much nutriance in it. The soil gives the plant they good nutriance that we eat. I had great luck with this…Thanks. I am trying this right now. I am trying it with redleaf though. It seems to be doing something as the stump leaves have greened up. I am just waiting on new ones to appear. Can you transplant the stump and grow it in your garden? Micaela, I’m not sure if the stump could be transplanted. I have never tried it, but my instinct is that it would not work. There would be no roots available to take up moisture and nutrients. After the romaine is cut away from the soil, I think the only option is to keep it going for a while hydroponically. possibly if you use a “Rooting Hormone”. Possibly, but I don’t think I would personally…not sure what rooting hormone is made out of and I am trying to go organic. The way the stems are cut here in NJ, they are flat and hard, if roots were to grow I think they would sprout above that portion. An organic rooting hormone can be made from willow. take some stems/twigs (especially good if there are buds, I understand) and crush them/break them/mash them and place in a mason jar. Fill it with water and leave it for a week or two. The water then carries the willow rooting hormones and work to spur a lot of plants to root. You might want to google this to get more information, but I have used it to help plant starts. Im sure going to try this one and see if i can make it work. Very interesting. Who knew? Certainly not me. i have my romaine replanted in soil and it is like the whole thing has come back to life! it is nice and green and growing noticeable amounts each day. i just have it in a small pot on the windowsill in very moist well drained soil. Jen K., do you have a photo? Interesting, I may try it out in the garden. Thanks. I’m so glad you enjoyed watching the lettuce re-grow…it is amazing! I have tried the organic romaine lettuce from root as well, although I planted mine straight in the ground and was able to pick from it 4 or 5 times. The base will eventually shoot up and start forming seeding, but I’m very pleased with the life I’ve gotten out of it! did you say you planted the stump in the ground? I am growing mine in a raised bed outside. I did nothing to them, just stuck them into the ground so that the root sections was firmly seated and within 2 days I had new leaves coming up. I have found it works with red cabbage, onions and celery also so far. I am going to be trying more “2nd” helpings as I get them. Thanks for this. I have a new raised bed and was reluctant to put my starters in b/c this thread has had no good experiences with it that I have read. Can’t wait to try it. this is great,I’m definitely gonna try it! have tried it with onions and it worked! I don’t really like onions, I did it for experiment’s sake,but I do like lettuce so this is gonna be so cool! I also have a strawberry plant for the first time!! 🙂 thanks for sharing this! This encourages me to try it with butter lettuce. It’s my favorite, but we can’t get any planted til fall. And it’s expensive to buy. However, if I spend $2.99 for a head of it, take off some of the leaves to eat and then plant the rest….hmmmm. really?!?! This is awesome… and I guess kind of a no brainer when you think about it LOL. I love this, thank you so much for sharing ( I love posts where the little light bulb comes on haha) I always hate having to just toss the excess Romaine so I will be trying this one soon! Thanks so much for stopping by…come again! You can do the same with celery. That’s really cool. If you are growing romaine in the garden you can also just harvest the outer leaves when you need salad greens and leave the plant intact in the ground to continue growing. Trying the romaine lettuce. I have 3 stumps. Only one really looks good. The other two have sprouted leaves, but very sparse. After 2 weeks, the stronger one started growing roots so I planted in dirt. I haven’t harvested the lettuce to eat yet. This is fun! I’m so glad to hear it is working well for you. Great tip! We do the same with the bottom white part of a green onion with the roots still on. Stick it in the ground and the green part shoots up for another crop! Great way to regrow lettuce! Sustainable gardening at its best. Thanks for the reminder as I am babysitting a budgie for now, and another tip for budgie owners is to sprout their millet spray ! they love it! I plnted mine in a small pot of soil and within a week it was growing new shoots. I placed mine in water and it has sprouted in less than three days. Celery stumps work well too, I have three in pots right now! Thank you so much, and wonderful to meet you too. I do this with my scallions all the time except that I keep a pot of dirt on my window sill to stick them in. We eat Romaine lettuce all the time so I’ll have to try this! Thanks. For those concerned about transplanting – most plants that do well with this re-rooting method (which is what you’re doing – the plant had roots at one point, the grower or the store cut them off, and it’s still living (if it weren’t the whole thing would either be very slimy or paper-dry), so it’s ready to re-grow roots. If you want to transplant to dirt, start it first in a dish of sand, potting moss, or vermiculite (from a garden-supply store), or a ‘rooting medium’, which is a mix of those ingredients, and keep it very moist. Then when you see leaves start to grow, transplant to your garden or to a pot of dirt. I haven’t tried this with lettuce yet (although I will now that I’ve read this!! ), but I have with other plants. Some will grow, some won’t, depending on how recently they were picked. For those worried about nutrients, the main nutrients in lettuce are formed by the plant from water and sunlight. If you keep growing the lettuce (or any plant) in water and want to be sure it’s getting all the nutrients it needs, or all the ones you’d want to eat, you can either make a fertilizing solution or buy one from a hydroponic gardening store. Google terms like ‘home-made hydroponic fertilizer’ or ‘hydroponic nutrients’. You can also just put safe, mineral-rich things in the growing water. A clean eggshell, for example, will slowly release calcium. A few coffee grounds or a used tea bag will have a lot of nutrients that didn’t make it into the brew – just don’t add too much or you’ll overwhelm your poor baby plant! Celery, onions, and now romaine lettuce. I wonder what else! Great tip! I got the little gel pellets at our local dollar tree store and grew them with water. then when I used some leeks, I placed then in the bowl of the grown pellets and soon there after a week or so, the roots started to regrow and it began growing the green stalk. I would recommend buying these water gel pellets to regrow any stalks. just keep adding small amounts of water so that they will not shrink back. Carrot heads will also regrow. I tried it but the stump rotted. What did I do wrong? You can eat them at any time. If a stalk starts growing out the middle of the stump though…I would throw it out. The stalk is a seed stalk and means the lettuce flavor will be bitter. I don’t know much about this, so excuse me if this is a dumb question. But you mentioned the “seed stalk” and to just throw away when that grows. Wouldn’t you want to use that seed stalk for more to grow or is it not truly seeds to plant? and can you put more then one in a bowl , and how dose it do out side ? With lettuce in the garden, if you pinch off the seed stalk when it first appears you can keep the lettuce from becoming bitter for quite awhile. I like this and I’ll try it sure…. My Romaine Lettuce that I started this way is now spiking without actually producing healthy leafs to eat (more stalk), what can I do? Throw it away, try again…grow in a cooler spot. I found that when temperatures are higher where I am growing the romaine, the stalk seems to form faster. My best luck has been in a basement window. Good luck. What if you don’t have a basement? Any cooler window will do. Def going to try this. Can you regrow a new head from the original regrow? Usually small side leaves are what you will get. These taste good in salads. Can you tell me what you have it in? Soil or water? Thanks. Mine grew in water, but I now others have tried them in soil. This is really neat. I will have to try this. Thank you, I will try growing second harvest for romaine. Wonderful tip. Hi Suzgato, It sounds like leaves you are describing to me. The seed stalk comes up out of the center. Anything on the sides or near the center are probably leaves. I have tried that and all of mine grew really weird and fell over what did i do wrong to make them fall over. They were well lit and i changed the water every day. How big do your leave get? I harvested my leaves while they were still small. You will never get a large leaf that is without bitterness. It is best to use the leaves while they are newly sprouted. I planted my scallions in a bucket and I have been harvesting fullgrown scallions for 2 years now. They do great on my porch. I am going to try the lettuce, carrot planting. Can you regrow garlic this way as well? For garlic I would probably plant a whole clove in soil. If you replant a carrot top, you will never get another carrot. You just get a mass of roots and a big bushy top. It only makes the tap root once when planted from seed. Thanks Nan, That makes perfect sense. I know that it is very hard to even transplant a seedling that has a taproot. Thanks! Very cool. This will go well with my indoor garden. Some kind of animal came to my garden and ate all my lettuce down to the ground. It turned brown on top where it met the dirt. Noticed yesterday that a few are getting new shoots. Is it o.k. to eat if indeed it does grow? Sure…just wash as usual. All of us probably eat things nudged a bit by animals. I tried this technique but the romaine lettuce just turned brown. Any suggestions? How long did it take to start growing? It should start to grow within a day or two. If it does not…toss it and try again. Have tried this over and over again and the bottom rots and stinks long before I can get a harvest. Any suggestions? I have the same problem with celery. Thank you for the advise. I’ll give your suggestions a try. Great growing! Thank you for visiting and commenting on my blog. Happy Day to You! this really works. I have romaine lettuce growing the new leaves in a couple of days! Hi, Wendy! I use this technique for my plants I use as food: put some vinegar in that water. When it starts to get murky, it is most likely bacteria, fungi, or both. White vinegar is great at killing both bacteria and fungi. My first Romaine heart died for the same reason your’s did; I didn’t get to the water in time (to add vinegar). So, with the second batch I was determined to keep a better eye and watch for murk. I change the water and switch between filtered and filtered mixed with tap water. As I said before, once I see too much unwanted growth, I spray in some vinegar. Thanks for the terrific tip Joyclyn. Thank you for the follow. I’ll be around often to visit. I love the ideas posted here. If I wanted to regrow cabbages, will I use the “stump” like lettuce? Which part of cabbage should I use? Hi Grace, Sorry it took so long to get back to you. I would use the flat area on the bottom. This is where the cabbage was cut away from the roots in the ground. Place this piece in a small amount of water to keep it wet, keep in a cool place in a good amount of sunlight, watch for regrowth. Use the regrowth in salads, etc. 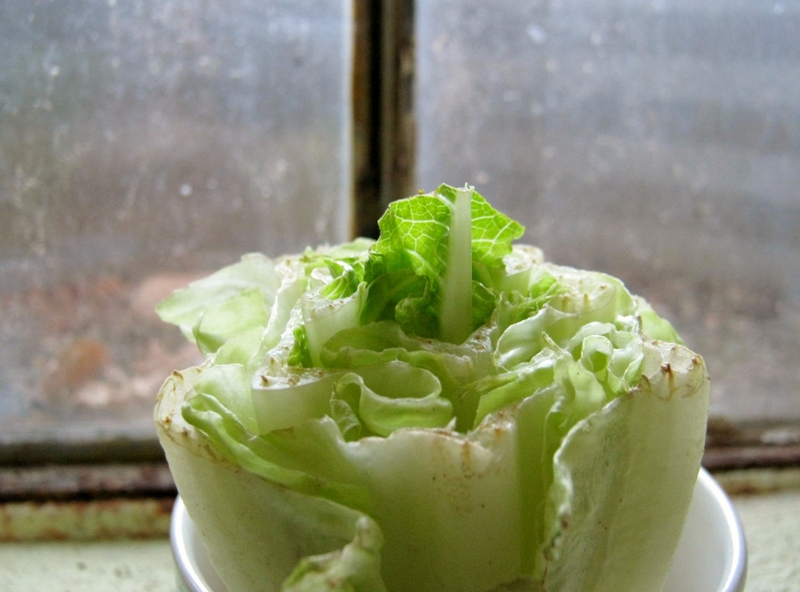 It won’t regrow into a whole cabbage head, but most likely you will get some tender new growth to use in dishes. You brought a smile to me this Saturday morning…sharing little bits of my life brings me joy. Have fun…and happy growing. HOORAY!!! I love to hear news like that! How often do you change the water? As soon as it looks a little murky…that can be daily if the bottom softens, or as infrequently as a week if the bottom stays hard. Happy Gardening. It’s an amazing thing when that romaine stump begins to grow again. Hi! I just stumbled upon your blog today and coincidentally, I just planted romaine like this about 2 weeks ago. I left it in the water for about 5 days and then transferred it outside (we live in Florida so it’s been nice and warm for them) and it seems to be doing well. Smooth bright leaves (albeit, pretty sparse) and about a good 10 inches tall each but like I mentioned, there aren’t many leaves at all…is this typical, do you think? Or should I maybe start over? I know you mentioned that they’ll never be huge and bushy like the first head it was planted from but this seems exceptionally thin. It will never regrow into another “head” of romaine. It will give you side shoots to eat in salad. I have not put mine into the garden…at least not yet. When it seems to stop producing leaves, and the bottom gets mushy or very discolored…out it goes into the compost heap. Does it have to be organic vegetables to regrow? No, any old romaine stump will do. 🙂 Many other vegetables will regrow too…green onions, celery, if you research it on the web you will find many things that can regrow. Thanks for the comment. Hi. What type or brand of soil should we use to plant the lettuce and celery in? I don’t plant mine, I let it grow as long as it will in water, use the leaves it sends out, and then discard it. Can you take off the tops of Romaine in the garden spot in dirt and will it come back from the heart as the ones in water???? I am not sure…I tend to think it will not work. 1. When do I re plant it in soil. And how should I re plant . Should I bury the whole ice berg in soil or leave the top part a little out. 2. Should I just keep changing water every day. Hi Sangita, I have never replanted mine, I just harvest the new leaves and use them in salads, etc. I know that some of the people who have commented have tried replanting in soil, but I am not sure of the results. Yes, I would change the water every day or every other. Thanks for the comment. Have a great day! Heya.. Im Vijay based from hyderabad/India. Im here in Dallas Fort Worth, TX for a short stay. the first time i visited walmart here.. i fell in love for the Romaine Lettuce (was not sure how it tastes, leave alone dint knew what it is in fact). As it was a $ for 3 shoots.. i got one. The next time i visited the Walmart store.. i got $15 stock and ate them in flat 4days in everything i ate. Im a vegan and this came very handy during this trip.. lucky enough to find cucumbers/carrots/ multi color cabbage – all my basic foods. Today after reading your blog.. i had put in a heart in water. Hoping it grows out well. I’ll have to give this a try. I attempted it with scallions but wasn’t successful. Thank you so much in return. Blessings. I did grow some cabbages but they only grew leaves. Is there anyway to grow roots? Thanks for the like and delighted to have found this advice on romaine lettuce which I will be trying some day very soon! Who knew? I always planted outside and the rabbits ate it ! I am so going to try this! It’s an amazing thing to watch it regrow. You’re welcome…it’s fascinating to watch it grow. I have started doing this as a cheap way to feed my bearded dragon. No pesticides, and not wasting the bottoms. A week of growing has given me 3″stems far. Going to try planting them to grow even more. So glad to hear that! It’s always terrific to get the most out of everything. Thanks for the comment. Hi. Can you give me some advice on replanting iceburg lettuce. I go through “atleast” a head a week. And I’m thinking as I go through them I can soak them then plant them in the ground when it gets warm out. I’m in New England. Do you think this will work or will they just turn into gross mushy ends in gross water? I’ve never done this. I have tried iceburg lettus, and nothing happened, it just kind of got all goopy and squishy. I guess it has something to do with the structure of the leaves. Thank you so much for great information on how to use this vegetable. I hadn’t thought of putting it into a juicer. Good call. Timelesslady: You are a very inspiring lady. I really enjoyed reading your posts. I prefer leaf lettuce, and will experiment with your technique on some leaf lettuce I have growing. I wonder about what to do for cilantro? Hi timelesslady, yes I know cilantro is a cool weather plant. I am praying for a real spring. You never know here in the Midwest. Of course that is pretty much the same all across the country. We used to have such long cool springs when I was a child. I just try the best to practice the 3 Rs. You have a blessed day. I will continue to try and grow it. We have had strange Springs the last few years…it takes a while to warm up, then suddenly, instead of Spring it’s feels like summer. I will give this a try. Left condo living in Miami to house in north Carolina and now have a yard. Planted seeds for tomatoes, sweet peppers, yellow squash and cantaloupe. Have fun! It’s amazing to watch the romaine resprout. I am so intrigued by this! After reading about regrowing veggies from my scraps, I started a celery and a romaine stump in water. Both were doing great. After about 10 days, I planted them in a small pot, and they both seem to have stopped growing since that time. It’s been about a week since I planted them. Any ideas on what is going on? Should I take them out of the dirt and put them back in water or just give them more time? I’m wondering also if I could plant them outside in my garden? Since I’m a complete newbie to this, I have lots of questions, but I would love to be able to regrow these successfully! Thanks for any advice you can give! Hi Pam, I have never replanted them, only grown them on hydroponically until they stop producing or the stump becomes mushy. I don’t think they develop a large enough root system to draw water out of the soil once they are harvested. Thank you for the prompt reply. I think I may try them both ways and see what happens. I enjoy an experiment. This bring up another question. If they are only growing in water, where does the plant get its nutrients? So many questions . . . The plant’s existence is short grown this way, the technique is a way to get a few leaves more for your money, and is also fun to watch. I only take one additional harvest. I think the plant might continue to grow, but at that point I would consider the romaine stump spent, and compost it or throw it away. At some point the nutrients the plant contains will diminish without growing in actual soil or an hydroponic garden set up. I would add what you have to your salads. I have planted the cut off piece in dirt outside. Cut the leaves off the lettuce to the stump each time, and each time it grew again. I placed about six plants in a large container, and we had lettuce all summer long. It was incredible. Love to hear this as I have never tried to plant into dirt. Did you take any photos…please share on this post in a comment if you can. The question has come up many times and I’ve never had a good answer. Thanks so much! How deep did you plant the romaine? I didn’t replant…just grew in water. I thought about planting again, but decided it was easier to just grow in water. I think others might have replanted…you can check through the comments to see…it’s been so many years…I don’t remember if anyone did or not. Sorry I am not more help to you. I stuck the romaine heart stump directly in the ground last Saturday 6/13/15. It has already sprouted new leaves by Thursday 6/18/15 and is growing surprisingly quick! Sidenotes: Zone 6, its been raining for at least a week straight, & I already use organic fertilizer and repellent in my garden. Wow! I’m very impressed by this. I have only grown it again in water…never tried to reroot it in the ground. I’ll have to advise others who ask if it will grow in the ground to read your comment. Thanks so much! I am doing cabbage in water and have 6 new leaves now what do I do ? I really love this idea and when can I start to eat it ? thanks Julie. I think you can throw almost anything in that blender! Well…I guess I better qualify…anything healthy! Hi, I haven’t ever planted this in dirt, but have just harvested the side leaves that sprout while the romaine stump is in the water. At some point, the plant will stop producing. I don’t know if anyone has had any luck with it re-rooting in soil. I’ve done green onions too! 😀 I’ve never eaten all the way to the bottom. I’ll have to see how far down I can go to use the pieces in my salad. Do you cook it first? You can regain lettuce? Wow! Did not know that! You’re welcome. That would be so cool! My dad used to do this when I was little. It’s a fun process. Children love to watch the progress. At my grandson’s Science Fair I saw quite a few experiments using the technique for many different vegetables. I never knew this; what a great idea. Celery and green onions will also regrow…probably other vegetables with an intact stump. Be careful with green onion. You can’t eat the regrowth; you will get sick. I didn’t know that…thanks so much for the information. i have eaten the regrowth with zero issues. many years now and we havent had a single problem. i even dry and regrow every year. hope i didnt jinx myself now. I have heard that there was a bout of salmonella a few years ago connected to some green onions. I hope you didn’t get a batch of those. I usually grow it on a windowsill, haven’t done so for awhile. I have a nice head of romaine right now, maybe I’ll grow this one. How do you get the romaine to form the tight head? Mine are just stalks with the leaves sticking out the sides. I always harvested those leaves sticking out the sides and tops. I don’t think this will regrow into a complete head of romaine. I live in Florida and have no basement. I’ve tried this in the kitchen window and it is really too hot there. It grew small not like yours. Love yours! Thanks Carol…I haven’t tried it for a few years. Lately I’ve been cooking up compost with most of my veggie scraps. It is fascinating, but I can see how a hot window would hinder the growth. What a joy to live in Florida though…warm most of the year…lovely! Fascinating. Romaine is my favorite lettuce. Enjoyed your post! Yes I have done this and should again. thanks for the reminder. With the problems in the Romaine gardens lately it would be smart. ps, Thanks for the follow. I don’t do this as often as I should but I do reblog a lot of Godly information I get from others. I am mostly a crafty grandma and try to stay clear of subjects that others can do better.